Pittsburgh circa 1907. "T.J. Keenan Building." Tenth Floor: "Electric Light Baths." 8x10 inch dry plate glass negative, Detroit Publishing Company. View full size. Submitted by J W Wright on Tue, 09/06/2011 - 8:05am. I was just in Pitts this summer, had I known of this building, I would have tried to get a look around the top floor. Next time! Submitted by Root 66 on Thu, 09/01/2011 - 1:07pm. that the "Battle Creek Method" somehow involved Corn Flakes or Pop-Tarts or the like! Submitted by Dave on Wed, 08/31/2011 - 6:50pm. 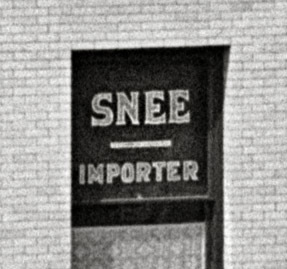 Why, I can remember a time when all our snees were made right here in the U.S. of A. Submitted by stanton_square on Wed, 08/31/2011 - 6:45am. Carpentry and Building, October, 1907. 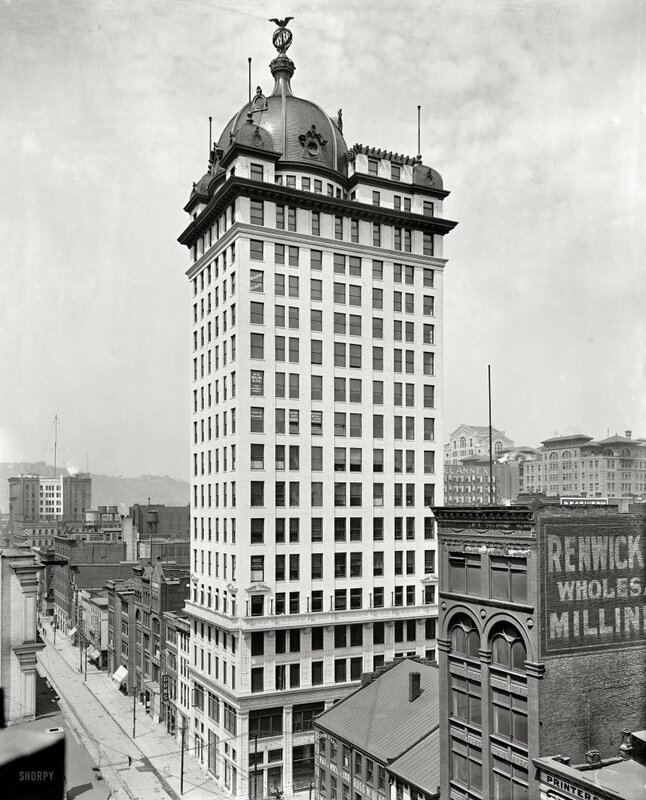 One of the unique features of current architecture in the city of Pittsburgh is the new Keenan Building now in course of erection at the corner of Liberty avenue and Seventh street, and which when occupied will be 18 stories in hight. It will embrace in its architectural treatment some rather novel features of ornamentation and among other things it will be the home of the Chamber of Commerce. While being the second tallest office building in the city it will be the first and, outside of the City Hall, the only structure of its hight that will have a dome. The latter will be of tile construction with copper ribs and will be surmounted by a copper eagle which will appear with outspread wings measuring from tip to tip a distance of 12 ft. The facades of the structure will be of marble with enameled terra cotta trimmings for the first five stories and the balance will be of enameled brick. The main entrance, and the halls from the twelfth floor up will be lined with marble. … According to Thomas Hannah, the architect, the structure will cost in the neighborhood of half a million dollars, and it will rise to a hight of about 305 ft. above the street level. The first 12 floors of the structure will be devoted to store room purposes, and those above to offices. It is expected to have the building ready for occupancy about the first of May next year. Executed by the Winslow Bros. Company, Chicago, 1910. 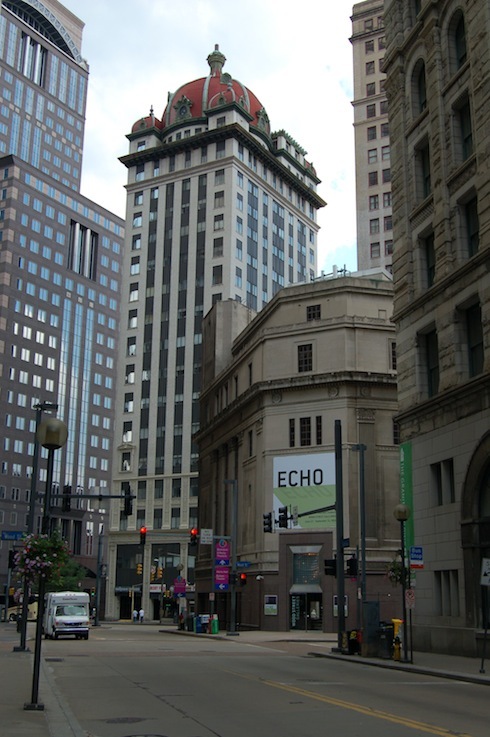 Pittsburgh, Pa., Keenan Building, Thos. Hannah. Submitted by kirkbrewer on Tue, 08/30/2011 - 9:24pm. The "Battle Creek Methods" and Light Baths on the 10th Floor refer to practices developed at the Battle Creek Sanitarium. The facility followed the health principles of the Seventh-day Adventist Church, and it was closely associated with John H. Kellogg after he became administrator in 1876. Lots of the Sanitarium's practices would be considered unusual by today's standards. T.C. Boyle's "The Road to Wellville" takes a sardonic look at the facility and its leaders. Submitted by switzarch on Tue, 08/30/2011 - 2:47pm. Atleast they appear to have left the decorated columns alone. It could have been worse. I'd love to see what's within the dome now; wonder if he had a private elevator? Submitted by Jeff M. on Tue, 08/30/2011 - 2:44pm. I just noticed the window sign for "Brighton Heights" up near the top--which is a neighborhood on the north side of Pittsburgh, and which I guess, started out as a subdivision being promoted here. But seriously--who was supposed to be reading these? This was the tallest building in Pittsburgh! Submitted by gblawson on Tue, 08/30/2011 - 2:41pm. A businessman who really planned ahead no doubt -- about 104 years ahead. Submitted by walt on Tue, 08/30/2011 - 2:29pm. A quiet health home for invalids and sufferers from chronic ailments. Located on an elevation, surrounded by spacious, shady lawns. Fully equipped for the successful treatment of diseases of the stomach, liver, kidneys, blood and nerves, by other methods than drugs. The famous Battle Creek Methods -- water, in the form of baths of all kinds, sprays, douches, packs, etc., electricity, massage, Swedish movements, dieting, etc., are used under the direction of a physician of fifteen years' experience in these procedures and a graduate of the Battle Creek Sanitarium. Surgical and obstetrical cases received in special wards. Lady physician gives especial attention to diseases of women and children. Rates, $10 per week and upwards. Submitted by GWHinLA on Tue, 08/30/2011 - 1:26pm. 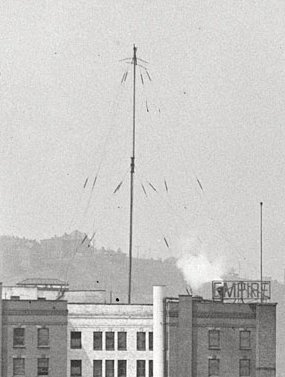 Any idea what this curious structure is atop the Empire Building? 1907 would be too early for a radio antenna (which is what it certainly looks like). Submitted by SJBill on Tue, 08/30/2011 - 12:41pm. The application of this system in a scientific and efficient manner requires a large corps of nurses and assistants who are trained in the technique of hydrotherapy, massage, manual and mechanical Swedish movements, graduated exercises, medical gymnastics, electricity in its varied forms, thermo therapy, mechanotherapy, phototherapy, rational dietetics, the out-of-door method, and various other physical and physiologic agencies, in addition to the methods of ordinary hospital practice. It is only by this concentrated fire from a well-trained therapeutic battery that those Gibraltars of disease commonly called incurable maladies can be made to capitulate. Submitted by jackwarr on Tue, 08/30/2011 - 9:30am. So who is the target audience for the business name printed on the window on the tenth floor? Submitted by cnik70 on Tue, 08/30/2011 - 7:54am. It's still there, though the first floor is now a 7-Eleven and a few other now closed storefronts. All the buildings to the left of it are long gone. Submitted by Jeff M. on Tue, 08/30/2011 - 7:52am. Happy to say the Keenan is still mostly here, despite a somewhat unsympathetic '60s rehab. Is currently subsidized housing, of all things. 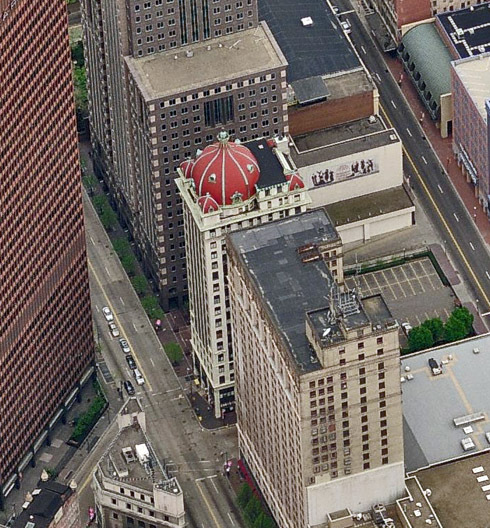 Supposedly the dome was once the apartment of the builder, who published the Pittsburgh Press. Submitted by Mr Mel on Tue, 08/30/2011 - 7:49am. Window advertising on the 16th floor of a building doesn't usually attract crowds of clients. Submitted by Ice gang on Tue, 08/30/2011 - 6:34am. And just what "methods" did they have planned for me? Another greater mystery is, could you possibly read those window signs from the street, and did you wander down the avenue, look up, and realise you needed dental supplies? Submitted by ossewa on Tue, 08/30/2011 - 6:19am. Thanks for posting this terrific image of Pittsburgh's coolest building. The Keenan Building is, in my opinion, the most "honest" skyscraper in America. Rich men construct these buildings as symbols of their power and potency; Mr. Keenan put a rounded cap on his white monolith and removed all pretense; "Yeah, that's my junk." Pittsburgh architecture: always a good story. Submitted by RoccoB on Tue, 08/30/2011 - 5:15am. Any ideas of what was up on the top floors? I see a tilt/turn window propped open there.